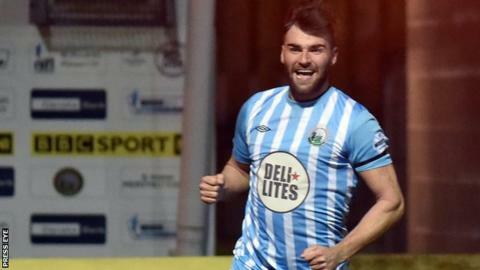 Warrenpoint Town will hope to continue their remarkable winning run in the Premiership when they face Dungannon Swifts at Stangmore Park on Monday. Barry Gray's side have taken maximum points from their last four matches, scoring 12 goals and conceding none. In the night's other two league games, Glenavon host Glentoran and Portadown travel to Ballinamallard United. Carrick Rangers play Amateur League side Crumlin Star in a rearranged Irish Cup sixth round tie at Seaview. The winners will have home advantage against Crusaders in the quarter-finals of the competition. "We are just glad to have regular games. There has been so much 'is it going to be on, is it not going to be on' since we have had the problems with the pitch at Taylor's Avenue," said Carrick manager Gary Haveron. Warrenpoint now lie just one point behind fellow strugglers Ballinamallard, Dungannon and Carrick at the foot of the table thanks to a seven-match unbeaten league run which stretches back two months. "We are in a position now where nobody wants to sit out games. All the players are eager to get started again so everyone will be ready to go on Monday night," said 'Point boss Barry Gray. "The players we brought in during January have brought a freshness to the changing room and competition for places. "They have brought quality too and the players around them have stepped up to the mark. "Whether it's enough given our poor start to the season, we'll have to wait a couple of months to find out." Glentoran will be out to avenge a 4-1 sixth round Irish Cup defeat by Glentoran at the Oval when the sides meet again at Mourneview Park. The Lurgan Blues must plan without striker Eoin Bradley, who was sent-off in the 1-1 draw with leaders Crusaders on Friday night. Portadown central defender Ken Oman is suspended for his side's trip to Ferney Park after being dismissed in the victory over Linfield but Ronnie McFall's side should have Garry Breen and Sean Mackle available again. Ports assistant manager Kieran Harding has hailed the impact made by ex-Linfield and Derry City midfielder Philip Lowry since his recent arrival at Shamrock Park. "Philip has outstanding energy and he covers the ground. If we had him from the start of the season, we may not be in the position we are in," argued Harding, whose side have moved up to seventh in the standings. Mallards boss Whitey Anderson lamented his team's performance in a 3-0 loss to Warrenpoint on Friday and has made clear that he expects more from his players. "You can try to play all the good football you want, but unless you can display heart and desire it counts for nothing. That's what I want to see," said Anderson.